It was a leftover 2013 Cruze Eco with a few extra doo-dads added to it. It came from another dealer and had window tint, fog lights and other things already added that I didn't have to pay for! The car is a Crystal Red Tintcoat color that is extra cost but again, I didn't have to pay for it! I was able to get over $5,000 off as a dealer employee with incentives. Not too bad at all. It's an automatic but I'm excited either way. 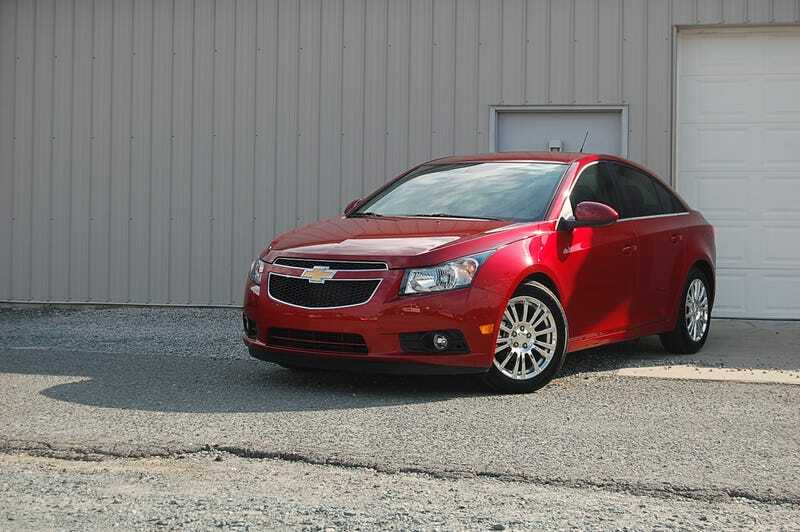 I thought I was ready for a big boy car with the Equinox but it drove too loose for my tastes compared to the Cruze. I'm really happy to be back in my little car. The Equinox didn't handle poorly for what it was, just not what I'm used to. I like my fun little cars apparently. Interior shot. I really kind of dig the black. The only gripe I have is that the MyLink screen cannot be independently dimmed from the IP lights. Small gripe but that thing is super bright even at reduced brightness at night. I really like the 1.4 turbo motor in these cars and have had two previously. Maybe I'm done buying cars for a while? I don't know but I'm happy my payment went down significantly.